German World Cup winner Birgit Prinz is thinking over Perugia's offer to become the first female player in Serie A.
Prinz is a prolific striker and was one of the leaders of Germany's team that won the World Cup title in October. Perugia president Luciano Gaucci has been pursuing the idea of signing a female footballer for some time, and was thought to be keen on Sweden's Hannah Ljungberg. "We met one week ago," said Prinz. "He'd like to sign me. But it was nothing more than an informative talk. Everything else will come later." Gaucci is hoping to finalise Prinz's move next week. "We met last week in Rome, and she took a few days to think about it," said Gaucci. "Next week, we'll define the details of the agreement. "I hope to have her practising with the team before Christmas, and then in January she would be available to play. "She is very beautiful, and has a great figure. I can assure you that as a player, she's very good." 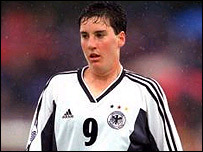 Prinz, 25, helped Germany to a 2-1 extra-time victory over Sweden in the Women's World Cup final on 12 October. She scored seven goals in the competition. Second to Mia Hamm in last year's voting for Fifa's World Player of the Year award, she is one of three finalists for this year's prize, to be announced on Monday. Gaucci is no stranger to controversy, having signed Saadi Gaddafi - son of Libyan leader Colonel Muammar - in June. Gaddafi, who has not played a Serie A game, was suspended from the Italian football league after testing positive for nandrolone last month. Despite the fact that a female player was recently banned from playing in Italy's amateur leagues, Gaucci said he expected no problems getting Prinz to play in Serie A. "Seeing as she's a citizen of an EU country, I repeat that there is no such regulation that would limit her from playing with men," he added.